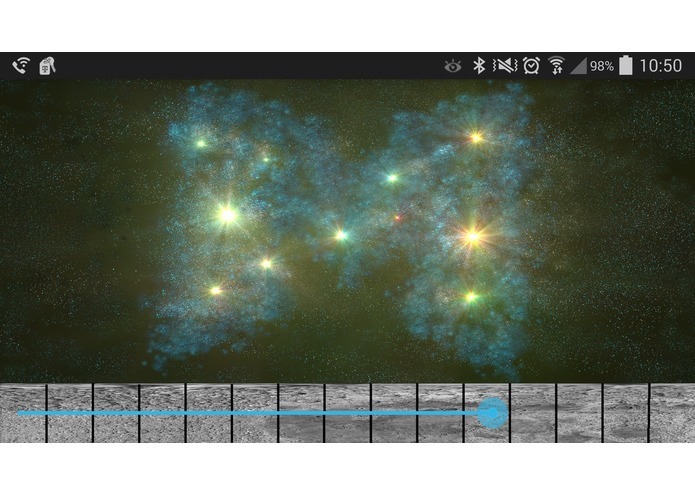 Song of Stars is a mobile keyboard run on Android, controlled by your hand motions that are tracked by a Myo armband. We wanted to create a project that would include music and the Oculus Rift, to do a virtual reality music visualization, complete with three dimensional graphics of flying through space based on body motions. But we ran into challenges early on the project and the Oculus Rift was not able to run the graphics that we wanted. We changed much of our project decided to use a Myo. It's much simpler to use to track hand and arm motions. In the future, we want to add another Myo to for the other hand and produce a wider range of notes and sounds. This could be used for virtual conducting, music conducting, and live performances.